Located right on the edge of the sea, you just can't get closer to "fun in the sun and the sea" than this lovely hotel. Newly remodeled rooms and bathrooms, this grande dame of Cote d'Azur hotels celebrates the old and the new simultaneously. 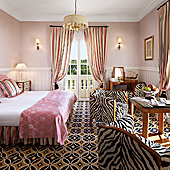 The 5 star Hôtel Belles Rives, renovated for the 2011 year, in glamorous Juan-les-Pins on the Cote d'Azur, is steeped in the history and mystique of the French Riviera. Starting life as the "Villa Saint-Louis", home to the extravagant and notorious Fitzgerald's, Zelda and Scott, the villa and Juan-les-Pins was filled with celebrities from all walks of life, especially the arts, making Juan-les-Pins "the" place to be. 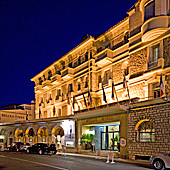 Hôtel Belles Rives, officially, came into existence as a hotel between 1930-31, the first seaside hotel right on the beach on the Riviera. It has been returned to its 1930's authenticity with charming rooms, each with its own personality, are furnished with style and grace but with modern facilities. The usual amenities abound but be sure to ask for a sea view room most of which are equipped with a small balcony from which to gaze across the "Golfe Juan" with the open Mediterranean out to the left. The light over the waters is ever changing with the sun rising behind the hotel and etching the bay and the far shores in that crisp early morning brush. As you eat dinner on the terrace with its view across the Golfe, the sun sets behind the far hills before disappearing and leaving a glorious twilight in which to finish your meal. The hotel wide renovations have upgraded the rooms with wifi, flat screen TVs and all the mod cons. The bathrooms are done in earth toned Carrara marble. The hallways done with a sense of an Atlantic liner theme. The public rooms exude the style and graphics of 1930's. The Grand Hall was restored to its past grandeur. The designer recovered its historic colors, enhanced by thin linings of gold and silver. The ancient Venetian techniques were used to install the "Terrazzo" flooring. The interior of the hotel's restaurant "La Passagere" was restored from old photographs. Local artisans produced the glass from Biot, on the dining terrace the tiles are from Torto and covered with planters of olive trees, bougainvillea, geraniums, palms and cactus and citrus. In short, the hotel as it has been brought back to its former glory is a place that exudes the richness of its past coupled with all the comforts we expect today all joined with the threads of the ambience of Provence. You can also have an open air massage, relax in the hammam and heated outdoor swimming pool and more. 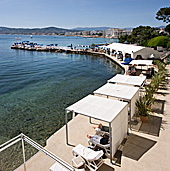 Juan-les-Pins is a charming small village within a few steps from the hotel. Filled with a proliferation of Gelato stands and stalls, cafes, restaurants and boutiques as well as a charming tree shaded park with a great playground for the kids and a dedicated "boules" court right on the seashore, there can be no excuse for boredom. So join the ranks of such notables as: Ernest Hemingway, Pablo Picasso Rudolph Valentino, Maurice Chevalier, Jean Cocteau, Josephine Baker, Ray Charles, Edith Piaf, Omar Sharif, Michael York, Sarah Ferguson, Susan George, Linda Gray, Johnny Halliday, and the list goes on.